Mastuj is situated on Chitral � Gilgit road about 107 Kilometers from Chitral enroute famous Shandur pass. This particular spot is surrounded by a cluster of beautiful hills and the terrain has its own beauty and grandeur, a plateau situated at just over 7500 feet above sea level. 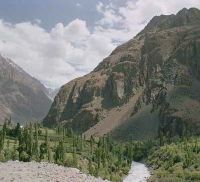 The area is surrounded by lofty mountains and is ideal for breaking journey on Chitral-Gilgit route. Cancellation Terms and conditions:- No cancellation Charges if canceled 2 days prior to arrival 1st Night Cancellation charge if canceled at the last moment. PTDC Motel Mastuj in Chitral, offers above rates only to Hunza tours. The online reservation payment must be made to Hunza tours not the hotel. Book your events, Meetings, Conferences Marriage parties at PTDC Motel Mastuj or any other hotel in Chitral please feel free to email us we will offer you the best possible rates and perfect arrangements to suit your events. For room reservations at PTDC Motel Mastuj Chitral please contact usTravel & Culture Services are hotel reservation agents in Pakistan. We reserve hotels at special discounted rates for individuals and companies.